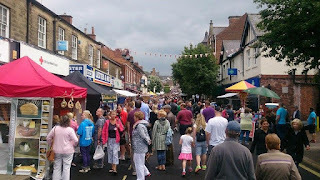 Belper Food Festival - 12th July 2015. 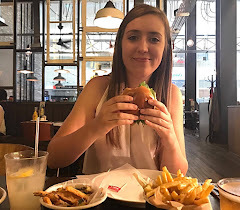 So, this post is a little different to normal but it does still involve food & eating! Today, me and my mum went along to the Belper Food Festival. I heard someone mention that this is the 9th year that it has been running, but I've never been before, so I decided to take a look! From the moment we arrived in Belper I knew it was going to be a busy one. The roads were jamming, car parks full and pedestrians everywhere! I arrived on the main street and was amazed at how many people were all crammed in! 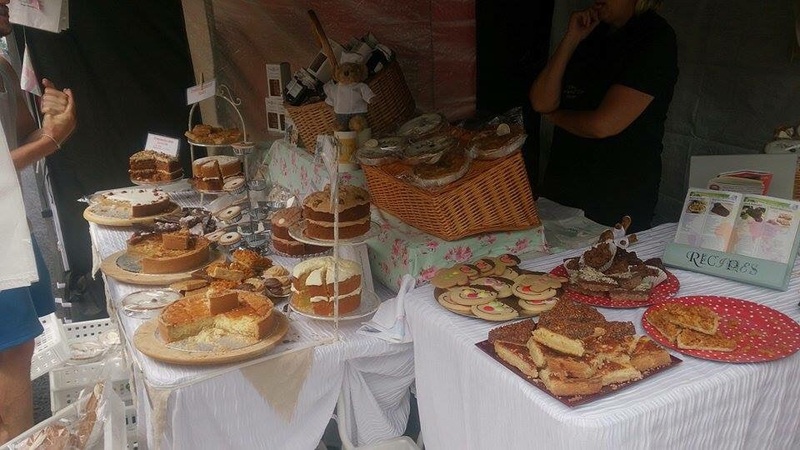 There were over 100 stalls all filled with local produce as well as live music. 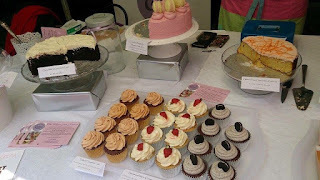 The ones that I was most interested in were the cake and chocolate stalls...yum. I didn't buy anything from any of these, but I did sample some (okay, a lot) of the chocolate in the last picture from The Bittersweet Chocolate Company. This was possibly the nicest chocolate I've had for a while. The texture, the flavours, the whole thing was just to die for. My favourite was the lemon chocolate, but I also tried others such as the dark chocolate and orange and a lavender flavoured one too... I know! Lavender? I decided to buy a millionaires shortbread. 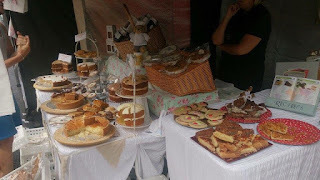 There were lots of bakery/ cake stalls but I wanted the one that looked the best, regardless of where it was from. I opted for one made by Alice in Bakerland. 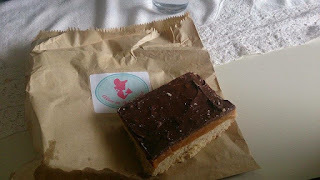 It was nice and chunky with good sized layers of shortbread, caramel and chocolate. It was lovely! I'd definitely have one again that's for sure! Now before we left, we told Bob (our Beagle) that we would get him a treat as an apology for leaving him behind. People did take dogs, but I wouldn't recommend it myself, it is very tight and narrow to walk down the street with all of the people there. I wouldn't like it if I was a dog. We came across a stall called Mrs Bishop's Doggy Deli who are located in Kimberley. 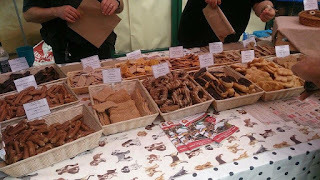 They had a variety of homemade doggy treats in all different shapes and flavours. They give them all catchy funny names too which I thought was great. Dog-gestives, Cherry Barkwells, Pawbon Biscuits.. you get the idea. 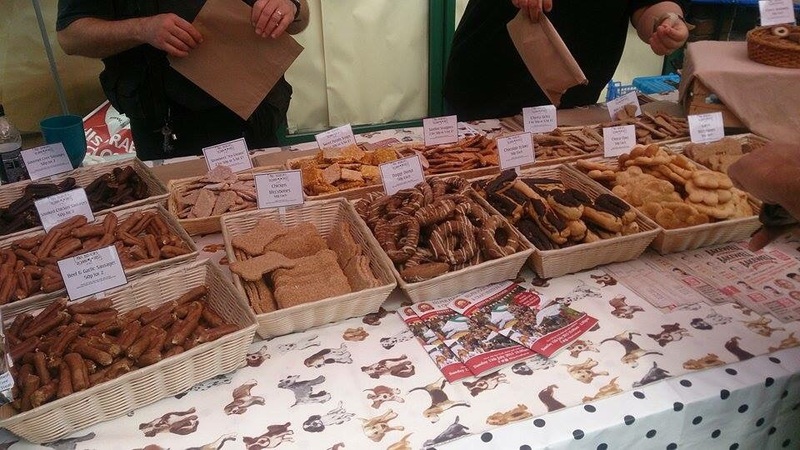 These are all made in their 'Barkery' using only the finest locally sourced ingredients. I'll definitely be paying the Deli/ Barkery a visit sometime soon! Overall, I had a nice time. The weather was dull and rainy but this didn't seem to put people off at all. 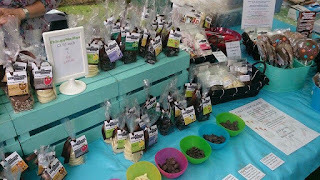 We were there a good few hours and there was plenty of stalls to browse and there is no admission fee which is a bonus. If you get claustrophobic, I'd probably give this one a miss though. The Belper Food Festival is hosted annually and they also host a Winter version too!